Scar Management and Reduction – Post Surgery treatments for reducing visibility of cosmetic surgery scars. At Chugay Cosmetic, we are committed to helping you get the best results from your surgery. To that end, we have searched for the products that help achieve the best results possible. Your surgical results are only as good as your scars; and, for that reason we have chosen to use BioCorneum(R), the only advanced scar treatment with FDA-Cleared Silishield™ patented crosslinking medical grade silicone and SPF 30, to help all our patients achieve the thinnest and most aesthetically pleasing scars possible. To further help in the perioperative period, we also recommend using Arnika-Forte(R), a special formulation of Arnica and Bromelain designed to help minimize bruising and swelling in the post operative period and help you get back to full activity sooner. Our chosen product to address scarring is Bio-Corneum+ (or BC+), which is first and only FDA accepted scar product on the market. Using BC+ will provide the best environment for the scar to heal and will help speed up the healing process. We recommend that all of our patients use this after their sutures are removed and their wound is closed. We carry this in our office as a convenience for you. It is a self-adhering, self-drying silicone cream that also contains a mild broad spectrum SPF 30. At suture removal, start applying BC+ twice a day very sparingly to your scar for twelve weeks, or until you stop seeing noticeable results. If you have a tendency to form hypertrophic or keloid scars, you may want to use it for 6 months to a year. BC+ has been shown to help prevent the formation of these types of scars. One drop is enough to cover a three inch linear scar. Massaging BC+ into your scar will help to break up the scar tissue. BC+ should dry right away and within a few minutes will form a slick surface over your scar. BC+ will gradually wear off throughout the day, which is why we have you reapply it at night to make sure you are getting a solid 24 hour per day exposure to the silicone. If you have any questions, please ask your patient coordinator. 20 gram tube – ideal for linear scars less than 6 inches in length for 12 weeks of use. Ideal for procedures like primary breast augmentations, face lifts, and liposuction scars. 50 gram tube – ideal for linear scars less than 12-15 inches in length for 12 weeks of use. Ideal for procedures like abdominoplasty, breast lifts, breast reduction, bracheoplasty, and two or more procedures at once. 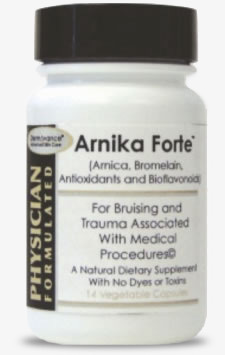 We have chosen Arnika Forte as our preferred treatment for scarring and bruising. It is the only combined Arnica Montana and Bromelain capsule on the market. It can only be purchased from a physician. It is the highest pharmaceutical grade and the highest strength of both available. Treatment starts the day before or the day of surgery and continues for six days after. Take two tablets per day for a total of seven days until all capsules are completed. Bromelian – 100 mg ( 2400 GDU) Bromelain is a proteolytic enzyme from extract of pineapple stem – Helps to dissolve the bruise by digesting the proteins in the bruise. Bioflavonoids– Grape Seed Extract – 240 mg and Rutin – 100 mg – Vasoprotectants to help strengthen capillary walls and reduce extent and duration of bruising. The vegetable capsule aids in faster absorption. Arnika Forte contains no artificial dyes or colorants. The formulation does not contain lactose as do some of the Arnica Montana products.